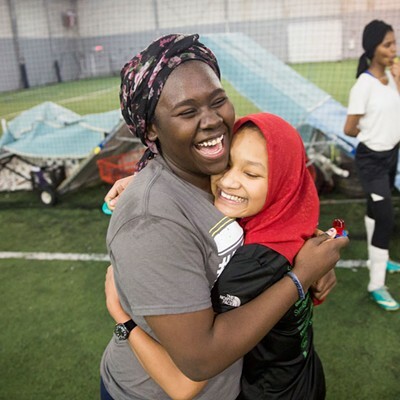 Among the soccer players gathered at the Shelburne Field House on a Saturday evening in late February, Binti Abdullahi cut a stark figure in her loose-fitting black dress and hijab. Standing on the sidelines, Abdullahi, the manager of the Golden Blazers Girls Soccer Team, looked exasperated. Few of her charges were on the pitch. Most were still in the changing room. By contrast, members of the Somali soccer club Juba Star were already playing a game on the adjacent field. "Let's go, let's go," Abdullahi yelled at no one in particular. "There's no time to fool around. Argh, they're so slow," she vented, sitting down. It didn't take her long to rise again; Abdullahi's second child was due in four weeks, and sitting gave her cramps, she said. Despite the approaching due date, she wasn't taking it easy as she filled in for Coach Odysseus Manzi, who had called in sick. The rest of the players trooped onto the pitch, where some handed cash to Abdullahi. As team manager, she's in charge of collecting money to pay for use of the field. At about quarter past eight, the Golden Blazers were ready for practice. Amid cries of "Come on, ladies, let's go" and "Catch up, catch up," the players ran around the pitch and stretched their hamstrings. Meanwhile, Abdullahi arranged mini-cones on the field for the team's next set of warm-up exercise. She watched, arms akimbo, as the players did lunges and jumping jacks. During the scrimmage, Abdullahi yelled out tactical advice and encouragement from the sidelines. Dodging and shielding her face from flying balls, she urged the players to "take a hit [because] it's supposed to make you stronger" and told them they were doing a "good job." 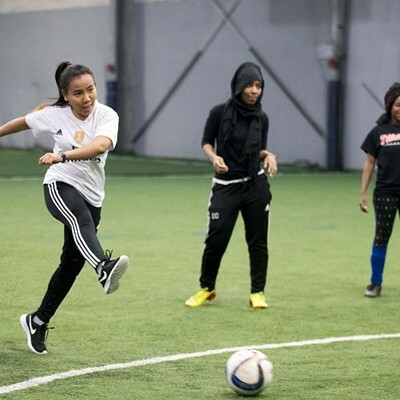 The greater Burlington-based Golden Blazers consists of 14 young women from the Nepali, Burmese, Gabonese and Somali communities. In January, a month after they first gathered to organize a team, they convinced Manzi to be their coach. A clinical social worker at the local U.S. Department of Veterans Affairs Vet Center, he has experience as a Juba Star coach. "Coaches get a sense when players are eager to learn and are coachable," noted Manzi in an interview. With these young women, whose ages range from 14 to 22, "I saw that within the first practice," he said. Some of the players observed that it's uncommon for women in their cultural communities to be physically active. "Most Nepali girls don't like sports," said Anjana Raika, a senior at Burlington High School, who plays forward for the Golden Blazers. "They like dancing and other stuff." Dahero Iftin, one of the four captains, said, "Some [Somali] parents think we're going there just for the boys, when it's really not [like that]. [We want] to have fun and get in shape," the Community College of Vermont freshman explained. At 14, Sami Lar is the youngest on the team. The freshman at Winooski High School is candid about the escape that the game offers her. "I grew up without a dad, [and] my mum has a mental health illness," she said. "[Soccer] is my escape from reality ... The energy I put in, I [feel] I'm doing something good." While soccer formerly was a sport played predominantly by boys and men, three FIFA World Cup wins for the U.S. women's team have increased the sport's popularity among females, Manzi observed. "There's a competitive spirit in young women, just like in young men," he pointed out. And the Golden Blazers players "are serious about wanting to come together as a team." Manzi's coaching history with some of the players goes back further, to his work with Juba Star from 2010 to 2016. In 2012, he helped coach a fledgling team of Somali girls. Abdullahi, then 17, was one of them. That team dissolved within a couple of months, as had another Juba Star girls' team before it. "The boys laughed at us," remembered Abdullahi, now 22, who was a member of both teams. "They're like, 'You guys are supposed to be home.'" When another former Juba Star player, Zahra Mohamed, suggested last fall that they form a soccer team, Abdullahi was skeptical. "I kinda lost hope," she admitted. "Twice, we tried. The adults didn't believe in us. We didn't believe in us." But Mohamed was determined. Although her stint with the Juba Star was short, she — like Abdullahi — remained physically active. Mohamed played sports, including softball and basketball, and ran track during middle and high school. In her senior year at Winooski High School, she played on the soccer team. "I really wanted to play soccer again," said Mohamed, who also is now a freshman at CCV. 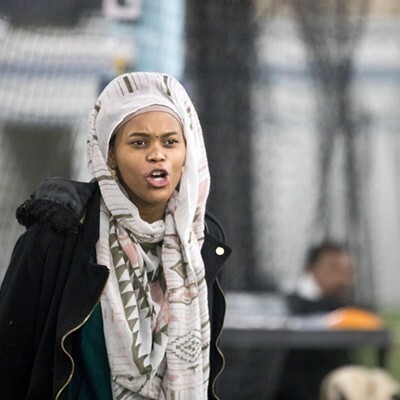 Despite her initial reservations, Abdullahi supported her friend, and the pair began to recruit players. This time, however, Mohamed also reached out to young women beyond the Somali community. 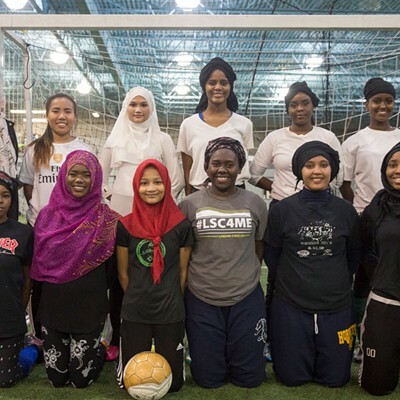 "We're different shades of brown," said Mohamed, another captain, of her teammates. For now, the Golden Blazers don't have a team uniform. But they've set a standard that accommodates players who are Muslim. When the team had its first meeting in mid-December, members came up with a list of rules. Rule No. 10 addresses the dress code: "Shorts with something under or sweatpants." That means the players have to cover their legs. 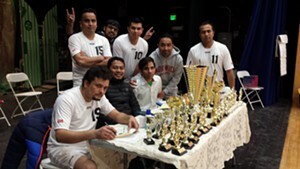 Muslim players also don their headscarves. Some wear their head coverings in a turban style instead of letting the ends hang over their shoulders. "Sometimes when I'm playing, it gets so hot," admitted Sami Lar. "And when I'm running, the hijab can fall off." After she took a tumble during the drills, the Burmese teen asked a teammate to help redo her undone hair bun. Seconds later, both players returned to the field. 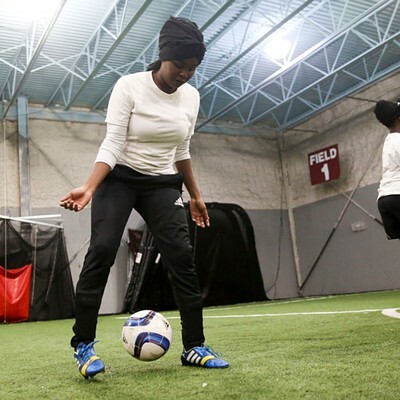 When she wore leggings under her soccer uniform at Burlington High School, Abdullahi said, getting stares and questions was the norm. "[My] teammates are always wondering, 'Oh, my God, why are you wearing this? Isn't it hot?'" she said. "I just explained to them ... ''Cause if I don't, then my mom won't let me play,'" she recalled with a chuckle. 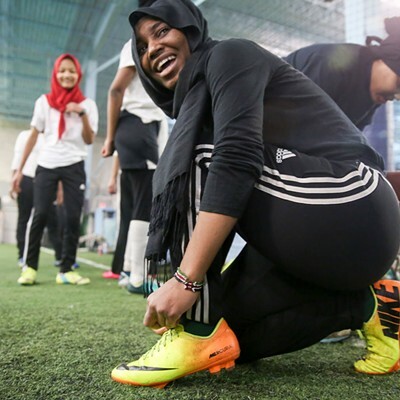 Like Abdullahi, Mohamed wore leggings under her high school team uniform, and her garb didn't prevent her from participating in matches. "I don't think uniform or religion has ever been a problem," she said. Her parents, Mohamed added, were more concerned when she had to stay out late for practice. The Golden Blazers haven't yet played a match, but they practice under Manzi's supervision for about two hours every Saturday at the Shelburne Field House. 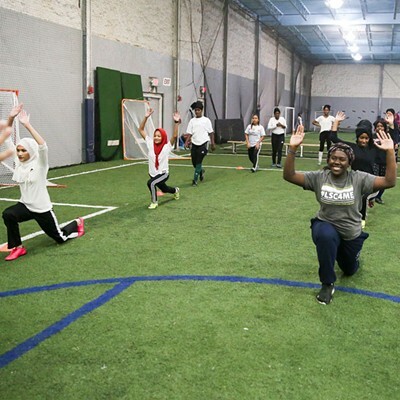 Previously, every other Friday, they trained for free at the Edge Sports & Fitness, piggy-backing on a program organized by the Multicultural Youth Program at Burlington-based Spectrum Youth & Family Services. But the more experienced players, such as Raika, Sami Lar and Juanita Yangambi, think the team needs to practice more often. All three play for their high schools and joined the Golden Blazers because they wanted to remain active during the winter. "In [the Burlington High School] team, we worked more on conditioning and kicks," said junior Yangambi. "In the Golden Blazers, we play [more] than we practice." 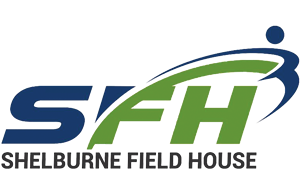 An increase in required practice time might make the team inaccessible to some players, however; not all of them find it easy to come up with their weekly $10 payment for use of the field. Sometimes the captains and Abdullahi have to contribute extra to make up for a shortfall. Some players balk at taking their turn between the goal posts because they don't have goalkeeper gloves. Finding transportation to practice is another recurring problem; the team captains sometimes have to ask Juba Star players, including Abdullahi's husband, for help. Recently, to fund the field and their uniforms, Mohamed and some of her teammates collected bottles from private residences, stores and gas stations. After three hours, they had four big bags, worth $6.25. The GoFundMe page they created to raise $4,000 has only netted them $5 since mid-January. But financial constraints haven't deterred the players from dreaming big: They'd like to join the Vermont Women's Soccer League. "We used to be really bad," admitted Raika. On a scale of one to 10, she rated the team as "not even a five." Now she thinks the team is a "six or seven." Mohamed agreed. "I really think our team can become bigger," she said. Coach Manzi is a little more cautious, suggesting the players need "a few years at least" before they're ready to join the league. In the meantime, he wants to organize a couple of friendly matches over the summer, including one on World Refugee Day in late June. For her part, Abdullahi said the doubled childcare commitment may keep her from joining the team. "My family doesn't live here," and if she did ask a relative to look after her children while she played soccer, "I think I'll be looked at funny," she explained. "'Don't you have a home, a husband to feed and take care of?'" she asked, mimicking some of the questions she would probably face. "I am not prepared for that part." But Abdullahi said her husband is supportive of her desire to play soccer. The childcare arrangement is something "me and my husband are going to have to figure out." 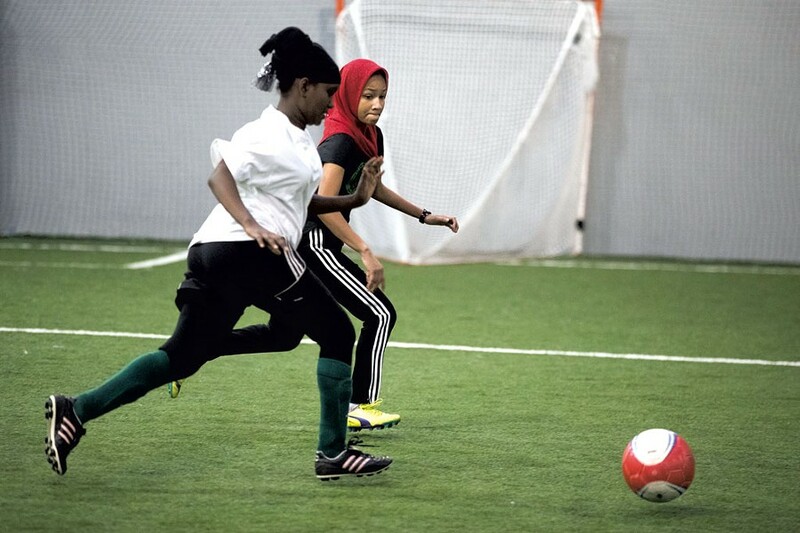 The Golden Blazers Girls Soccer Team practices every Saturday at the Shelburne Field House. All are welcome. The original print version of this article was headlined "Game Changer"